Preview text is hidden text in your main email design and displays in the email client when the email arrives in the inbox. Use preview text to help subscribers learn more about the content of your email. Learn what preview text is and how to set it up in this support article. Which email clients support preview text? How to setup preview text in Modern Editor? Many email clients display a message preview in the inbox which is called the preview text. The preview text is just a sentence inserted in the HTML body of your email and will usually display beneath the From Name and Subject Line. Many email marketers think that preheader text and preview text are the same elements but they are in fact different parts of the email. The preheader text can actually be seen in the email when the message is opened. 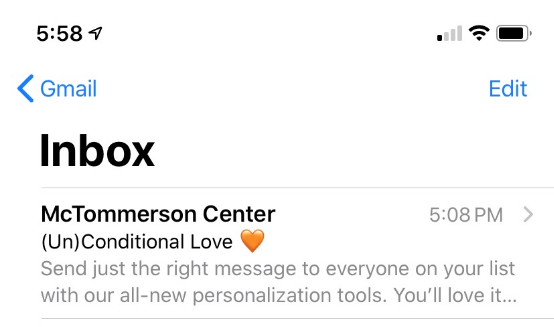 The preview text, on the other hand, resides in the message envelope and is typically not visible when the message is opened. The preview text is actually the first message the subscriber will see in their inbox when it is setup properly. Your preview text plays an important role in grabbing subscriber's attention. Use this element to add a bit of personalization (Ex, "Hello John!") and to give a sneak peak at the contents of your email. Avoid using this valuable space for best practice links (Ex, Unsubscribe and View email in browser), those links are best suited for the preheader or footer areas or your email. As usual, email client support for preview text varies. Not all email clients support it but most modern clients do. Even the amount of preview text displayed varies. Modern webmail clients such as Gmail, Yahoo! and Outlook.com. Our friends at Litmus put together the ultimate guide to preview text support. Learn more. In WordFly you have direct access to configuring preview text in the Settings area of Modern Editor. Access the settings area of your email by clicking on the cog icon from the edit panel (left side) of the editor. 1. Click on the cog icon from the edit panel of the editor. 2. Update the text in the Preview Text field. 3. Save your email template. The next time you send a test email you can see your preview text in the message preview under your From Name and Subject Line.